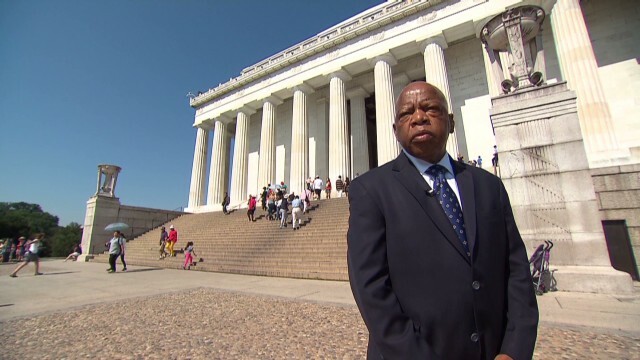 Months after leading the march from Selma to Montgomery, Alabama, civil rights leader John Lewis stood by President Lyndon B. Johnson and watched the Voting Rights Act become law. Forty-nine years later, Lewis, now a congressman from Georgia, commemorated the landmark legislation by taking to a relatively new forum for social movements - Twitter. In the 1960s, Lewis chaired the Student Nonviolent Coordinating Committee, leading the push to register African-American voters across the South. His non-violent tactics were often met with brutal opposition. As about 600 protesters began their march from Selma to Montgomery in March 1965, police officers and Alabama state troopers fell on the group with clubs, whips and tear gas. Lewis suffered a blow to the head from a state trooper during the march, and fractured his skull. The attack marked a turning point in the Civil Rights movement. Lewis later testified at a federal hearing about the march and, days later, thousands of marchers set out again - this time protected by National Guard troops. "Sniffit says, "We don`t have to". Translation-We can`t answer the question." Except I did anyway. So let me translate you in turn: "I don't have to read your whole post." Prove that the problem actually exists and that producing a select Voter ID will solve it. Look, smith. The head of the Pennsylvania GOP said it best, "Done, Voter ID, which will help Mitt Romney win the state." Pennsylvania also reduced hours at DMV offices, and cut the budget allotment for producing photo IDs. Many minorities work low wage jobs that do not pay benefits such as paid leave, which means that they must take a day off from work to go get the proper ID. That amounts to a poll tax for many people. Purchasing a copy of your birth certificate, poll tax. Meanwhile, outside of the urban setting who needs to go to a DMV office. People can go to most any store that sells handguns and apply/purchase a gun permit: days, nights, evenings. You do not find many places like that in urban settings. @Anonymous-What study shows that showing an ID doesn`t affect whites in a negative way but does affect non-white races in a negative way? What study shows that showing an ID reduces voter fraud at the polls? Rudy tactic 61-317462 – when confronted with a question you don't want to answer, answer it with another question. Rudy tactic 61-317462 – when confronted with someone manufacturing your side of the argument, ignore it.
" republicans have ==> always <== been about empowering the individual and enabling them to be self sufficient and prosperous "
The idea that repubs want to empower anyone but the super wealthy is incredible. The entire concept of 'trickle-down' is that you empower the wealthy and it (maybe) gets down to everyone else. Anyone who thinks repubs stand for a prosperous middle class is watching too much fox 'news'. Worse yet, believing them. @DM4O – Yeah, it's yummy. I'm usually a good boy who eats a vegetarian salad for lunch everyday. I usually do not eat more than 4-6 ounces of animal protein per day, if that much. I'm usually at half of that. I'm still turning heads whenever I trim back the gray hairs. Just saying – Now you're actually trying to rewrite history? As in 'textbook history'? Fact – Once upon a time there were jokes about republicans winning election below the Mason-Dixon line, and then SOMETHING happened and the South went Republican. It was like 50 years ago, give or take a couple of years... but what was it? Sorry folks, it's 'Once upon a time there were jokes about republicans winning elections below the Mason-Dixon line'.